When you have guests over for a cookout, it’s nice to start things off with a delicious appetizer before the main course is served. When guests arrive, have them gather around the grill and watch you put the finishing touches on a tasty appetizer they won't forget. Most parties focus on the main course, which is understandable; however, the appetizer is a great way to start an unforgettable cookout off. Sometimes, the appetizers allow room for a bit more creativity, and they can become the real stars of the show! Try these over-the-top grilling appetizers the next time you have a cookout. This might just go down as the most popular appetizer ever. The rich jalapeño pepper flavor along with the oozing melting cheese and smoky bacon is unforgettable. The recipe here is for 20 stuffed peppers. Begin with 10 large jalapeño peppers, remove the stems, and cut them in half. The spicy heat of the pepper comes from the seeds and the white membrane inside the pepper. Trust me: you want to scoop all this material out and discard it because it’s spicy! It’s easiest to scoop the inside out with a small spoon. I find that a teaspoon measuring spoon works really well. In a medium-sized bowl, mix an 8-ounce block of cream cheese and 8 ounces of shredded cheddar cheese together, and add a few tablespoons of hot sauce. Mix well until evenly blended. Scoop the cheese mixture into the halved pepper. You don’t want to put too much in or it will ooze out all over the grill; however, you want to add enough cheese to make the cheese level with the pepper. Cut strips of raw bacon in half and wrap them around each pepper. It’s best to find thick, lean bacon for this. After the bacon is wrapped around the pepper, secure it with a toothpick. These peppers can be made days in advance and stored in an aluminum tin in a refrigerator. Prepare a charcoal grill for indirect medium-low-heat grilling. It is easiest to place the charcoal on one side of the grill and then cook over the other side. After the coals are lit and dumped on one side of the grill to create an approximate 250–300 degree F temperature in the grill, add some smoked wood on top of the charcoal. This allows you to smoke the stuffed peppers right on your grill. After about 1.5 hours, the peppers should be very tender and the bacon should be completely cooked. If charcoal is not an option, you can fire up your gas grill and use the indirect method by lighting half the burners and placing the peppers on the other side to cook with the hood closed. As a last resort, this appetizer can even be prepared using the kitchen oven. The peppers won't be as smoky, but they will still be delicious! Everyone has eaten an onion ring; however, most people have not experienced a bacon-wrapped, smoked onion ring! You will quickly become a grill master/appetizer hero after serving these. Purchase large sweet onions (Vidalia, if you can find them). Cut the onions into 1/2-inch to 1-inch-thick rings. For stability, you want to have 2 layers of onion in each onion ring, so after cutting the onion, use your fingers to pop out the inner layers of onion, leaving the two larger exterior layers. Do this for as many onions as you need. The inner layers can also be used to make smaller-diameter onion rings. Don’t waste that onion! After the onions are cut, use a cooking brush to apply sriracha hot sauce all over the onion rings. 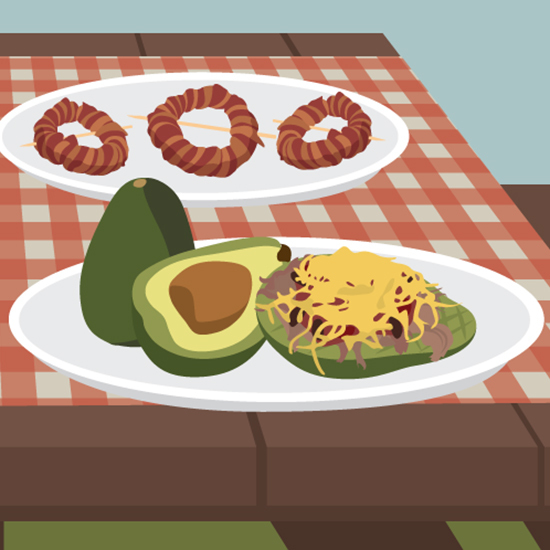 Wrap lean bacon strips around the onion ring. Depending on how large your onion is, you may need about 3 pieces of bacon to make it all the way around the ring. Use a skewer to secure the bacon to the onion ring. Sprinkle pepper on top of each bacon-wrapped onion ring. The grilling instructions for these onion rings are similar to those for the stuffed jalapeño peppers. Prepare a medium-low indirect heat in your charcoal grill. Add smoke wood and smoke the onion rings until the bacon is cooked and the onions are tender. This should take about 1.5–2 hours. The goal is to have crispy cooked bacon and a tender onion that you can bite through. This process can also be duplicated in a kitchen oven without the smoke. While the onion rings are smoking, prepare the dipping sauce by mixing a 1/2 cup of Sriracha sauce, 2 tablespoons of mayonnaise, 1 teaspoon of lime juice, and a little salt and pepper. Mix well and keep cold. This sauce is so good you can dunk anything into it. Avocados are becoming increasingly popular due to how healthy and tasty they are. Most grocery stores now carry a wide variety of ripe avocados at reasonable prices. Avocados are usually associated with guacamole, but this recipe showcases just how delicious an avocado is when it’s grilled, stuffed, and eaten directly out of the skin. Cut some ripe avocados in half and remove the large seeds. Collect ingredients to stuff the avocados. You can be creative here and have your guests make their own with various toppings. I like to use rinsed canned black beans, salsa, jalapeño pepper slices, shredded cheese, shredded chicken, and/or shredded pork. Prepare a charcoal or gas grill for medium direct heat. Grill the avocados with the edible side down and the hard, inedible skin facing up. Depending on your heat, you will get a moderate char after about 5 minutes. Turn the avocado over, allowing the skin to sit directly on the grill grate over the fire, and add your desired toppings. Close the dome for about 15 minutes, and let the toppings get hot and melted while the avocado softens and becomes warm. Serve with a fork so guests can scoop the avocado and toppings right out. This recipe is a fantastic way to get the flavors of a meat lover’s pizza with a quick grilled appetizer. Assemble your ingredients: a “pop can” of pre-made pizza dough, 1/4 lb Genoa salami, 1/4 lb sandwich pepperoni, 1/4 lb sliced mozzarella cheese, 1/4 lb sliced provolone cheese, jarred mild banana peppers, a jar of marinara sauce, and ground corn meal. On a foil-lined baking sheet, sprinkle some corn meal and carefully stretch out the pizza dough into a rectangular shape. Line the sliced meats down the center of the pizza dough, allowing enough room for the sides to be rolled up and sealed. Add the sliced banana peppers and top it all off with about a 1/2 cup of marinara sauce. Once the ingredients are placed on the dough, carefully fold the long sides of the dough up over the meat and seal. Do the same with the shorter ends to keep any sauce or grease from leaking out the sides. Prepare the grill for indirect medium heat (or use a 425 degree F kitchen oven) and place the baking sheet directly on the grate. Grill for about 10 minutes and flip the roll over. Grill for an additional 10 minutes until the dough is completely cooked and slightly browned. Remove the pepperoni roll from the grill, let it rest for a few minutes, and then slice it into 1/2-inch-thick slices. Serve with additional marinara dipping sauce if desired. With minimal preparation, you can elevate your cookout with one of these over-the-top grilling appetizer recipes. For the smoked stuffed jalapeños and bacon-wrapped onion rings, you can start cooking about an hour before your guests arrive. This allows them to grab a cocktail and head out to the grill to enjoy the smells of what you have cooking. After a little bit of time, the appetizers will be ready. For the pepperoni roll and stuffed avocados, your guests can watch as you put the final touches on them and place them on the grill. Following one of these recipes will make your cookout the most unique your friends and family have ever seen!